The death of a man at the home of a prominent Democratic political donor is raising questions and scrutiny about an earlier death at his home. Both deaths occurred at the West Hollywood, California, home of Ed Buck, who has donated to a number of Democratic politicians over the years. Now investigators are looking at both the most recent death, which was reported on Monday, as well as the overdose death of another man at the same residence in July 2017. The Los Angeles County Sheriff's Department responded to a call at 1:05 a.m. Monday that a person not breathing. Emergency responders performed CPR at the scene, they said in a statement released on Monday by the sheriff’s office, but the man -- whose identity has not been publicly released -- was declared dead at the scene. The sheriff's office said that the cause of death in this case has yet to be determined. New Jersey Gov. 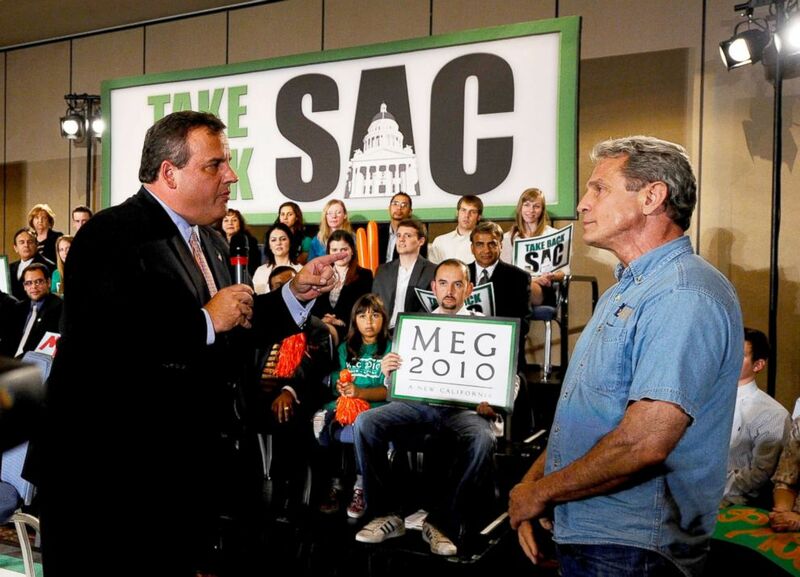 Chris Christie, left, confronts Ed Buck who disrupted California Republican Party gubernatorial candidate Meg Whitman's campaign event, Sept. 22, 2010, in Los Angeles. The death has prompted another look at the July 27, 2017, death of Gemmel Moore, who the sheriff's department reports was found to have overdosed at the home of Buck. "Mr. Edward Buck was present during both incidents," the sheriff's department said in their statement, adding that "investigators are conducting a thorough investigation, which includes follow-up interviews and a secondary review of the July 27, 2017 incident." The Los Angeles County District Attorney's office released a statement saying that they have "been in communication with detectives from the Los Angeles County Sheriff's department" but declined to comment further "due to the pending investigation." Buck's attorney Seymour Amster did not immediately respond to ABC News' requests for comment, but he spoke to ABC station KABC. "This is not a situation where Mr. Buck has caused the death. This is a situation where Mr. Buck has had longtime friends who unfortunately do not handle their life well," Amster told KABC. Amster told the Los Angeles Times that Buck was not arrested and is cooperating with the investigation. "From what I know, it was an old friend who died of an accidental overdose, and unfortunately, we believe that the substance was ingested at some place other than the apartment," Amster told the Los Angeles Times. "The person came over intoxicated," he told the newspaper. Protesters gathered at Buck's house Monday night demanding answers, and action. "It's clear that there's a pattern and a practice of Ed Buck to prey on vulnerable, young black gay men who are homeless, who are HIV positive, who he can manipulate with his money, and they end up dead inside his house," activist Jasmyne Cannick told KABC. The Los Angeles Times obtained the Los Angeles Coroner's report relating to the death of Moore,which stated that the man was found naked on a mattress in the living room and he had died of an accidental methamphetamine overdose. Buck has an extensive history of donating to Democratic politicians. Buck donated a total of $2,950 to Clinton, as well as donating thousands to California Rep. Ted Lieu and then-Rep. Kyrsten Sinema, who was just sworn into as a senator for Arizona. The Arizona Republic reported that in March 2018 Sinema donated $33,800 to charity in an effort to cut her ties to Buck. Lieu announced on Tuesday night that he was donating the amount he has received from Buck through the years to five different organizations focused on racial civil rights and gay rights advocacy. "I am deeply disturbed by the latest revelations of a second death by overdose at the home of Ed Buck," Lieu said in the statement. "While we await the results of the law enforcement investigation, I am going to donate the contributions I have received from Mr. Buck."